In height the mares found by Lady Anne Blunt in the stables at Had were certainly below that which would recommend them to English judges of insular ideas; but, as stated above, a very great increase in stature is observable amongst many animals of undoubtedly the purest desert blood in this country, where Arabs of 15 hands 3 inches are not unknown; similar cases have been reported from Hungary, where these horses are much appreciated. It is therefore incorrect to stigmatize the Arab as necessarily being a little horse, though many good judges prefer him small; and it is also a libel on the breed to reproach them with being light in bone. Of course, as in the case of all varieties, some Arabs are not so massive as others; many appear to be far slenderer below the knee than they really are, this fact having impressed itself very strongly upon the mind of the writer when he, quite unknown to the owners, some of whom he had never seen, measured the girth of the fore-legs of the competitors at the Crystal Palace show in 1896. In another respect the bone of an Arab is admittedly unsurpassed by that of any other breed of horse, and that is in its quality, as for density, fineness, and elasticity it is perfect, and hence, no doubt, the immense value of an Arab cross to certain breeds which are the victims of coarse, spongy bone. The Arab is also to be commended for his charming temper; excitable and spirited he is, no doubt, but vicious horses are very rare, in fact almost unknown, and a few soothing words, even from a stranger, if he understands horses, will usually quiet the most ruffled feelings. It has been remarked above that few serious attempts appear to have been made in this country to improve the speed of the Arab by scientific breeding, Mr. Wilfrid Blunt being a notable and honourable exception. The Arab also has seldom been subjected to a proper course of training, and the performances of some representatives of the breed when matched to run against Thoroughbreds at Newmarket can scarcely have been accepted as encouraging to Arab owners to persevere with them on the turf in this country. In India, however, Arabs run very well, and successfully carry big weights over long distances of ground in good company, their stamina being as pronounced as it is remarkable, considering that the chief grain they are fed on in their native land is barley. There are, however, many other uses for the Arab quite independent of racing, and it is surprising in the first instance to consider how his qualifications as a saddle horse have been ignored by the public. Detractors of the horse take exception to his shoulders, which certainly, as in all other breeds, are not invariably so good - that is, so long and sloping - as they might be; but in the case of the Arab the muscular development at this point is very great, and this circumstance not infrequently causes wrong impressions regarding the form and character of his shoulders. Moreover, those who try one generally pronounce an Arab a good ride; and it must not be forgotten by his detractors that he has never been subject to the degradation of leather by his owners in the East, but has been used as a saddle horse from time immemorial. 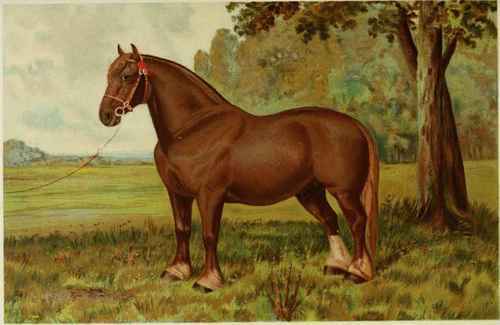 His big quarters, well-shaped, springy pasterns, and light head specially qualify the Arab for saddle purposes; and therefore, as he can jump well and stay, these properties, combined with his usually perfect manners, should cause him to be sought for as a lady's hack or lightweight hunter. As a cross for many other breeds the qualifications of the Arab are undeniable. Through the male line, at all events, he has given us the Thoroughbred, and probably the old Pack-horse, and through the latter the Hackney, and other breeds - two of the finest movers whose names appear in the Hackney Horse Stud-book, namely, Movement and Magpie, strain back on their dam's side to an Arab - and even upon these grounds it should be impossible to ignore his merits. Nor has the Arab been subjected to a course of treatment and training, such as that bestowed upon the Thoroughbred, which is calculated to impair his soundness. In the desert he is brought up hardy enough - Lady Anne Blunt reports having seen the choicest mares of the Hail stud standing in the open tethered by one foot to brick mangers, and covered with rugs, no shelter of any kind being provided for them; and in this country, to their credit, owners rarely coddle their Arabs. Consequently, when a breeder is anxious to impart quality, stamina, and constitution to his horse, speed and height at shoulder being secondary considerations, the Arab is more likely to produce these, and less likely to transmit infirmities than the Thoroughbred. As a sire of Polo ponies the Arab has done very well indeed, his stock having pace, alertness, intelligence, and manners to recommend them, whilst his first crosses with Suffolk horses have proved themselves big-framed, neat-headed, good-quartered, very useful animals, which look like carrying weight to hounds. The head of an Arab is of good size so far as the upper portion is concerned, being rather long from the ears to the eyes, and wide across the forehead, which should be convex and not flat, this being regarded as a fault. The ears are fairly long, fine, and pointed; the eyes not too full and soft in expression, but capable of showing excitement when aroused, the face often denuded of hair for a small distance round them, which gives them the appearance of being circled with rims of dark-coloured skin. The lower part of the head tapers suddenly towards the muzzle, which is very fine and imparts a blood-like appearance to the head, whilst the lower lip projects slightly. The neck is very powerful and nicely arched, with the throat well developed; the chest rather narrow, but deep, with the ribs swelling out behind the forearms, which causes the girth to be considerable; the back short, and the loins and quarters extremely powerful. The forearms are long to the knee, but the canons below are short; the pasterns long and springy, and the feet deep and sound. The thighs are big, and the joints all round should be well formed, the skin and coat being soft and silken respectively. The tail of the Arab should be set on high, and carried, as has been suggested, like that of a rocking-horse when at repose, but when the animal is excited it is raised somewhat. The position and carriage of the tail are points much considered in the East, and it is believed by some persons that the tails of young foals are twisted into the desired shape if they appear likely to be carried low. Colours vary in the Arab, bays, chestnuts, grays, and browns being all found amongst pure stock; but blacks, roans, and skewbalds are tabooed. The Emir Ibu Rashid, the owner of the Hail stud, according to Lady Anne Blunt, preferred a bay or a chestnut, whilst many persons would rather possess a white with black hoofs, but it is worthy of remark that of the hundred mares at Had forty were grays or whites, thirty bays, twenty chestnuts, and ten brown, which may fairly be taken to represent the usual proportion of the colours.